Elizabeth Adams is retired from a career which began as a resident representative for a tour operator. Having acquired a taste for checking holiday brochures and writing reports, she went into editorial work, first on magazines and newsletters for two INGOs, then on yearbooks and accountancy exam papers. Elizabeth is involved in various ‘green issues’ and has twice stood for the Green Party in local elections. She has self-published a booklet called ‘Signs of the Times: poems 1996 – 2016’, and is currently working on a second one. The host for the afternoon, Baden Prince (Jnr) is a dynamic poet, performer and storyteller who has been a part of London's thriving Live Literature and Spoken Word scene for more than a decade. He is the author of "The Shadow Dancer," a poetry pamphlet published by the Tall Lighthouse (sic) press. As a writer and performer Baden engages reader and audience with a style that is warm, self-assured and displays an entertaining blend of insight and humour. Between 2003 - 2010 Baden was organiser, promoter and host of "Speakeasy," one of the most popular and highly-regarded poetry events in London. His own performance credits are myriad and he was Writer-in-Residence with the London Borough of Havering's Library Service in 2003/4 and again in 2007/8. Baden also has a considerable pedigree as a Creative Writing Tutor and Workshop Facilitator. Bridget Badoe McQuick writes and performs as Lady Esi, and has performed at events, festivals and carnivals within the UK and internationally using various art forms such as dance, poetry, theatre and carnival arts. Over the years she has her poems published in a number of anthologies such as “Identities Unite” and “The Book of Freedom”. She has also contributed to a number of exhibitions at Bruce Castle Museum which include "Origins of the Afro Comb" and "Wraparound". She is a member of the African Heritage Writers Group and is working on pieces for their upcoming anthology due for publication in 2018. Combining her love of poetry, drama and dance, she has written two musical theatre plays called “Reminisce” and “A Yaa Story Knows”. Hilary Davies has published four collections of poetry from Enitharmon: The Shanghai Owner of the Bonsai Shop; In a Valley of This Restless Mind, Imperium, and Exile and the Kingdom, published in November 2016. Hilary won an Eric Gregory Award for Young Poets in 1983, has been a Hawthornden Fellow, Chairman of the Poetry Society, and 1st prizewinner in the Cheltenham Literature Festival poetry competition. For many years she was Head of Languages at St. Paul’s Girls’ School, London. She was a Royal Literary Fund Fellow at King’s College, London, 2012-6. She also reviews regularly in the literary press and her poetry blog for the Times Literary Supplement was featured on its online home page earlier this year. Abe Gibson is a London-born poet and storyteller. He was a member of the Brothaman Poetry Collective and has published a collection of poetry - Violently Tender. He has been writer in residence at Feltham Young Offenders Institution and at schools in Tottenham and Hackney. Performing at Word for Word, he was spotted by a representative from the London Museum of Transport where he has been writer in residence. He has curated poetry at The Room. His welcoming style captures even the attention of those who think poetry is "not for me". 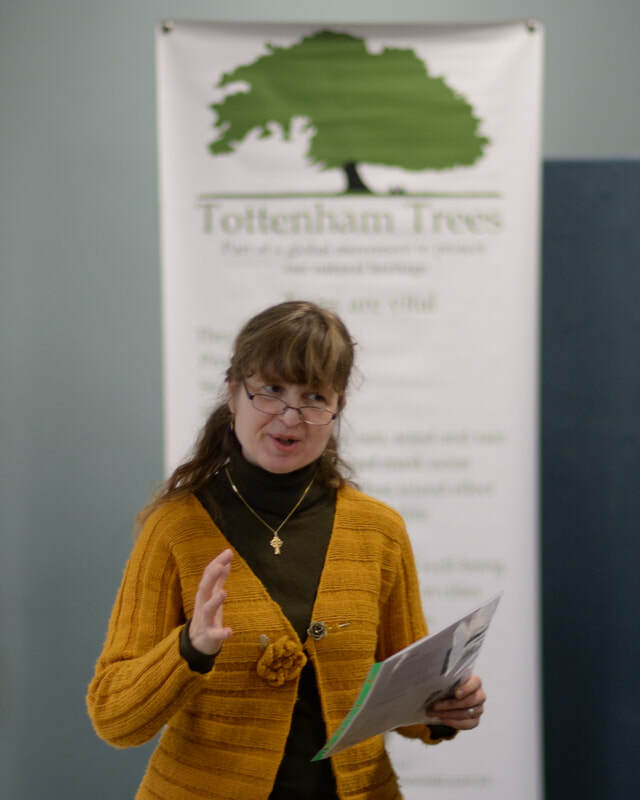 Christina Egan, another local poet, read two poems about trees in Tottenham. and worms and beetles through the days. of life on board the floating park! there is the snow, thick on the grass at last! the ground reflects the veiled and waning light. as if tranquillity and joy were here. Read the poems aloud to enjoy the sounds of the words, which emulate the fabric of the twigs and the whole web of Nature… and weave a spell, like poetry and song have done since there have been humans on earth. The second poem can also serve as a pagan, secular, or interfaith Christmas poem. The wanderer encounters that peace and joy which only Heaven can give in Nature. 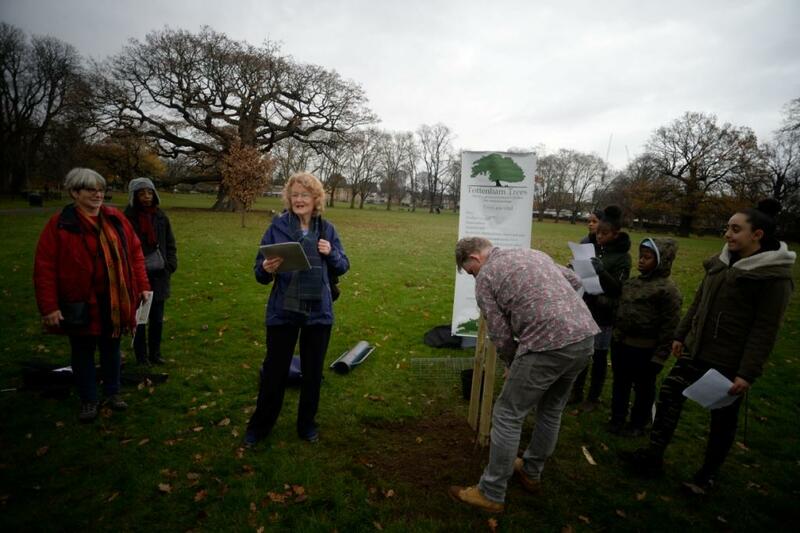 Sign the Charter AND a tree is planted in the UK! Contact: tottenhamtrees@gmail.org if there are any other events where Tottenham Trees could pop up! In Tottenham seven trees were planted in a ring over 400 years ago for reasons lost in time; the Seven Sisters area and the underground station are named after them. The seven trees have been replanted a number of times, always by seven sisters. The Tottenham Trees logo, shown on the right, is a silhouette of the Bruce Castle Oak with the logo of the Charter for Trees, Woods and People launched in November 2017, on the 800th anniversary of the Royal Charter of the Forest.